Some music documentaries appeal to everyone — fans, detractors, and the bystanders in-between. 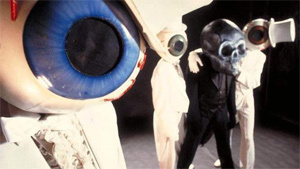 Unfortunately, Theory of Obscurity: A Film About the Residents is the other kind. I knew of The Residents before seeing this film. I had a couple of their albums on a cassette tape. I got to where I could tolerate them, and maybe even like their work in small doses. But they are not the kind of band you fall in love with. They are artistic and challenging and intellectual — not what you listen to for an emotional lift, and definitely not good for passive listening. And indeed I appreciated seeing more of their work than I had before. It’s nice to see that they are still touring, still working, and still creating. Their fans are legion and famous. Matt Groening speaks at length, as does Penn Jillette. Gerald Casale from Devo, another art/rock group, makes an appearance, along with many other musicians. But there’s not enough of an arc to the film to keep it interesting through the whole duration — at least not for this musical bystander. Maybe my friend Neil who gave me the cassette tape would disagree. One of the more interesting facts about The Residents is that the individuals in the band are anonymous. They always perform in masks and “nobody” knows who they are. Because the filmmakers play along (spoiler alert... the film does not reveal The Residents’ secret identities), they probably should have mentioned the anonymity once, then dropped it. Instead, the film spends ten minutes of screen time on the mystery, building up a lot of unresolvable tension that only serves to distract. Another problem is that the film is a little too targeted at its fans. During the early “anonymity” segment, we are introduced to interview subjects identified as members of the “The Cryptic Corporation.” But I don’t know enough about The Residents to know what that means. It’s not until about 30 minutes in that we learn what The Cryptic Corporation has to do with The Residents. The film makes a game attempt at finding a deeper theme. “Theory of Obscurity” refers to the idea that an artist who wears a mask is freer to make art than one whose identity is known. The masked artist is not influenced by fame or shame in the same way as an artist who exposes himself. That seems like a valid theory, but it’s not interesting enough to sustain 87 minutes. That’s not to say you won’t like Theory of Obscurity. My wife had never heard of The Residents and was happy to have been exposed. But this IndieGoGo-funded film probably had a lot of myopic producers who don’t necessarily care about the reaction of non-fans. Neil Paananen: Did I give you a Residents tape?!? I totally don't remember. What was on it? Yeah I helped fund the film a little through indiegogo but before I did I sent a message to the film makers -- "ok we don't need any more mythology or exaggerated stories about the residents, there's already plenty of them and i've learned by now to doubt the truth of most of them. what i want in a documentary is something which -- while not needing to go so far as to say WHO the Residents are, actually tells us the true story behind the music." Well I haven't seen the film yet but I already have low expectations, A career that spans over 40 years should be able to interest people for 87 minutes. They touched so many aspects of the art world and influenced a lot of people. Each time a new technology came along they embraced it early on. From a film lover's perspective they were doing a lot with visual images and short films early on -- they're an art project more than a band really. But to me, I know who the guys are basically and I'm just ready for a tell-all book or speaking tour, not parading through their lore one more time.